When to Call Flops Without Top Pair? The flop is central to any hand or action at a table. Pre-flop play sets up the hand – however by the time the flop comes down most poker players will have already decided whether they’re going to play the hand or fold. Knowing when to call the flop with less than top pair is one of the most important and trickiest skills to master in poker. The first thing to remember is that there is no way your opponents will always hit the flop. Just because you don’t have the best hand available, doesn’t mean you’re behind. The basic maths of poker is that an opponent will only hit the flop less than 40% of the time. Conversely, sometimes it can be very difficult to work out what everyone else at the table or whether you have the odds to call a flop. If you call a flop too often, you’ll lose money in the long run. In this article, I’ll go over the three critical factors which should help you make your decision whether to call a flop with less than top pair. Studying your opponent and assessing the strength of his hand is the most important thing when playing a marginal hand on the flop. If your opponent is aggressive, you’re probably better off folding a weak-ish second-pair type hand. This is because although he may not have anything, the fact he’s aggressive will mean you’re paying too much in pot odds to see the turn and river. Unless you’re actually considering raising against an aggressive player who always makes moves on the flop, you shouldn’t call with second or third pair. Study his continuation bets. If you see an opponent regularly betting out on a board with no face cards, considering his aggression pre-flop and LAG image, you should consider making a call with less than top pair. At the very least you’ll scare your opponent from wasting more chips trying to bluff you, and you’ll also likely have outs with respect to improving a mediocre hand. If you’re opponent is weak and makes a small bet, it’s also a scenario worthy of a call. By all means he may not have the best hand, and any bluff or danger card the turn brings could win you the pot with a semi-bluff. Another important factor when deciding to call the flop for the turn is the community cards laid out in front of you. To be frank, you should be able to tell between flops when you’re opponent has hit something, and when he’s most likely missed. For example, 87 is likely to be much better on a J84 board than a K27. If you manage to work out what range of hands your opponent is calling or raising the flop with, it provides you with invaluable information about playing the flop correctly. For example, if you know your opponent only likes to play J10 and higher, it’s unlikely he’ll take a pot down with no face cards on the flop. All good player know that the more outs you have, the more inclined you should be to call a flop with less than top pair. The more outs you have, the greater equity your hand will have and the more likely you’ll make money in the long run. In situations where you have outs, you still want your opponent to not hit back at you; however you want the equity there in case he decides to do it anyway. Here’s an example of having enough outs to call with less than top pair. 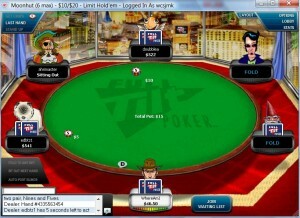 Scenario: $0.5/$1, short-handed cash game. Average stack is $100. In this situation, although pocket eights are a reasonable hand there’s actually much more value and strength in a hand like 6-7. This is because although 8-8 has more value in absolute strength, 6-7 has more outs and greater equity and implied odds. If you think about it, with 8h-8d, you only have two outs to improve your hand against top pair (i.e. 6% chance to hit on turn or river). However with 6h-7h you have two outs for the six, and 3 more for the seven – that’s 5 outs in total (9% hand-odds). Considering you have a backdoor flush and straight as well, it makes much more sense to play a hand like this over 6-7. This example shows why picking a hand with the right equity to call flop-bets is so important in the long run.